Basic Color Associations to choose the right candle for your purpose. Use candle only once for one spell! You'll need one candle of appropriate color, one holder, matches and heat proof container with sand to extinguish match. Push personal programmed power into the candle between your hands. Feel the energy streaming into it. Say appropriate words if you wish (create your own chant etc) simply stating what you need to occur. You can also at this time inscribe the candle with a word(s) related to your goal. For example, health, job, etc. 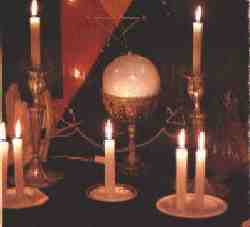 You may also anoint your candle with an essential oil mixture appropriate to you working if you wish. Place the candle in its holder. Strike a match above the candle and draw down the flame toward the candle. Light the Wick. Hold your hands around the candle's flame (be careful, don't burn yourself). Feel the energy. Visualize strongly. Leave the area*, and let the candle do its work. *As always, when dealing with fire, take appropriate precautions. For example, do not leave your house with a candle burning. If it is necessary to leave before it has finished burning. Extinguish candle and upon your return or even the next day at the same time, relight the candle while re-visualizing your intention.